I experienced my first Zwift glitch (say that 5 times fast!) and while it was frustrating it also made me very curious. In October I decided to give Tour of New York Stage 3 a go. Stage 3 was a lap of the Everything Bagel. It was also scheduled just after the world would change from Watopia to New York. Great! I found on the schedule the event I wanted to do. The very first opportunity to ride it. I was curious though… I live in California and my world wouldn’t technically change to New York until hours after the event happened. I figured once I joined the event it would plop me down into New York. It did not. There I sat, in the starting pens of Watopia, with 400 of my closest friends. Much chatter was had about whether the countdown to the start would find us magically transported to the correct world. “00:03…00:02…00:01…Enjoy your ride!” In WATOPIA! What? I was annoyed, people were commenting, we all felt put out. I finished the Watopia ride, a bit flustered, and immediately jumped on Zwift Riders on Facebook to see what everyone else was saying about the mess-up. In the comments of another’s post I found someone who said, “Jordan from Zwift sent out a message saying they apologize for the mistake and that you get the jersey anyway.” Sweet! But wait. Who is Jordan? And how did he find out about the mistake? And how did he fix it? So many questions! So I caught up with Jordan Rapp at Zwift HQ and found out all the juicy details. Jordan Rapp is a Game Designer at Zwift HQ in Long Beach, California. He first heard about Zwift when he was a pro triathlete increasing his training on Zwift in the winter of 2017 as California was hit hard with rain. Jordan was also the CTO at Slowtwitch and would end up occasionally interacting with Jon Mayfield there. 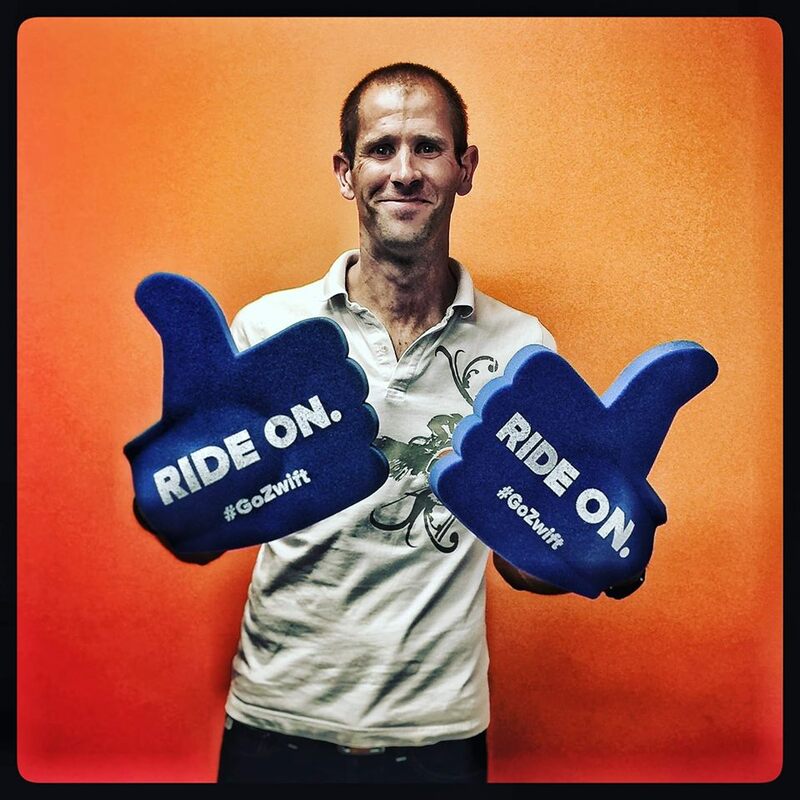 One thing led to another and Jordan eventually retired from triathlon to start work at Zwift. Jordan, who is responsible for in-game events, often checks in when a big event or event series is happening. Between watching the lines of communication surrounding an event and the use of Slack at HQ he often sees or hears about problems as they are happening. In my case, he found that the event hadn’t been properly entered as a world swap. A simple human error. Once he found out about the error he fixed the code. Because it was on a late join event he then logged in as a ride leader and let people know they could end their ride and log back in as it would then take them to the New York City world. They also made right with those 400 people and gave them credit for Stage 3 even if they only rode the 6+ miles in Watopia. I appreciated that! Jordan made mention that ZHQ has now made changes so this kind of error won’t happen again. But I wondered about other errors. He said that in cases like mine someone at HQ would then go through to ensure like-events won’t also have a problem. It comes down to a combined effort between customer service and the communications team. In other cases, such as big bugs that were somehow missed by QA they’ll quickly issue a patch. If it’s a smaller bug they may wait until their next planned update. Bottom line is, it’s Jon Mayfield’s call how to handle bugs in-game or on Zwift Companion. How do they help the unhappy? One thing Jordan mentioned more than once is the very clear love of Zwift the employees have for it. Because they love Zwift they almost all use it, which means there’s nearly always someone from HQ riding on Zwift. That means they often see the messages people are writing, and they are experiencing the same things as the rest of us: burning real calories, sweating real sweat, eating real Clif Bars, earning real XP Points, noticing real glitches. Cool! When it comes to bigger requests or issues within Zwift Jordan said there’s an ongoing (and growing) list of features to add or refine. A current challenge for them is that they are small, so developing a feature that may seem simple can still be a challenge if they want it done well. I appreciate hearing this as it makes me realize they do care, they are working on features, and they want it to be right! Jordan also mentioned that their real goal is to fix a mistake they’ve made without even having to be asked. I like that! If you DO ever have an issue while riding Zwift you can open a ticket at support.zwift.com where there’s 24/7 customer service. They’re also constantly watching social media (especially Twitter and Facebook) to make sure we’re happy…often working not just to fix the problem but also offering do-overs or giving credit for unlocking something you were working towards when the issue happened. “We have an awesome Quality Assurance (QA) team. Most (probably all) of them have a ton of experience in software QA and most have specific video game QA experience. 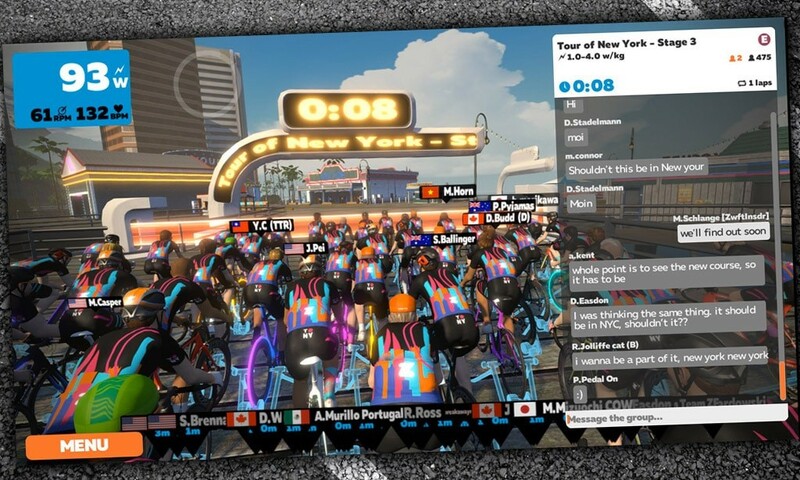 They are definitely the most unique group within Zwift. Lots of crazy action figures and video game paraphernalia. I love to spend time with QA, except if it’s because I broke something… They work really long hours trying to test pretty much every imaginable scenario they can. We have good tools – and they’re always trying to build better ones – but there’s always going to be some difference between a simulated QA environment and real people logging in from all over the world. They have a very formal process for testing all kinds of aspects of gameplay. Some of the tests they run are specific tests of new features. But they also are always running “soak” tests just letting the game run, and run, and run, and run, and run to see if they can find any weirdness. 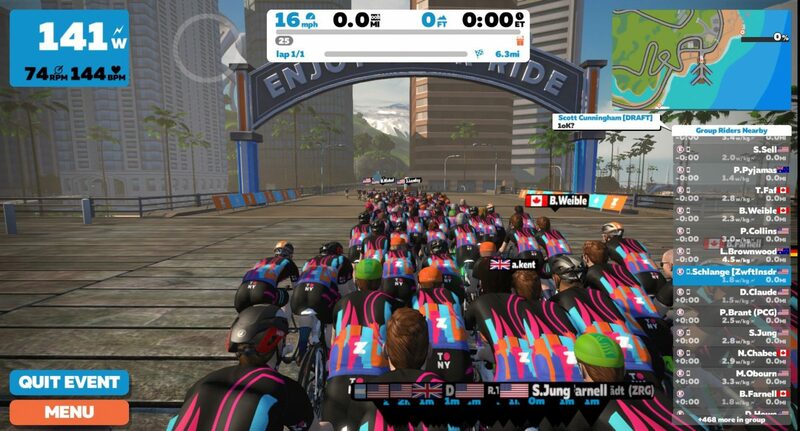 ZHQ has a server team with a tool to monitor the “health of the system, which includes automated alerts for big problems.” As for the human side of things, Zwift isn’t a typical 8am to 5pm, Monday through Friday company so there’s usually someone at ZHQ riding or running at any given time. So in a way, yes, Zwift is always watching. Thanks to Jordan for being candid about what happens at ZHQ! It helps me to know they care, they play, and they too are invested in this game we call Zwift! Click here to learn more about Jordan’s latest venture in his cycling life. We wish you all the best, Jordan! Ride On! Monica is a stay-at-home Mom and wife to Zwift Insider editor Eric. A casual cyclist, she is always pushing to better herself, often chanting internally as she's being passed on a ride, "You do you, Boo." As of late she enjoys trying new things on Zwift that others find intimidating so she can write about the experience and inspire others to push themselves as well. Great article. On rare occasion, I would see Jordan training on the roads near my house. He would be easy to spot if you saw a TT rider putting out 400+ watts and not even breaking a sweat. 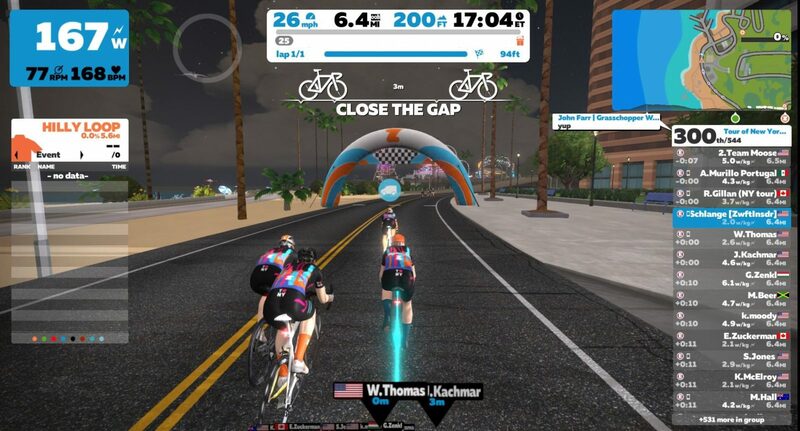 How does someone report a glitch to Zwift in case they’re not watching? For instance, I haven’t been able to screen grab my ride reports now for some weeks. When I use the screen grab facility on the PC or via the Companion app I just get the background image (at the end of a ride that’s just my avatar standing over the bike of course) but not the ride report that overlies the screen. I’ve been checking here to see if it’s been reported but I don’t really understand whether it’s possible to directly contact Zwift about it? Great content. It sounds like they have a pretty decent monitoring and recovery set up, and I’m glad they’ve done right by people impacted. One suggestion I’d have for them is to either test the large events (run a QA only event before others) or invest in some healthy checklisting. The human error described has definitely happened 3+ times for the early runners of events. What of you were able to do all the stages for a tour but the prize, tour of London and tour of New York jerseys, don’t show up in your “closet”? Shame it happened again for the Tour de Zwift stage 2! 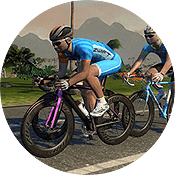 top 55 people at my stage 3 of tour de zwift rode another route at anohter world. Is it a major glitch?